Welcome! Vivace Restaurant, located on Ivy Road near the University of Virginia, opened its doors in July of 1995. Housed in the former main quarters of an old farm, Vivace attracts patrons with its diverse atmosphere. From the cozy intimate upstairs, which hints at the comfort and ease of Nona's home, to the vast expanse of our multi-tiered outdoor terrace, the ambiance at Vivace appeals to all. The 1940s hand-crafted serpentine bar in the lounge provides a festive setting for the light-hearted. For the romantic, enjoy a glass of wine by our inviting fireplace. From the moment you arrive, you'll discover that Vivace is full of Italian charm. Our unique decor will transport you to a quaint Italian village, creating a welcoming atmosphere. Jeff always wanted to own a restaurant. After college, his first restaurant job was as a busboy at the Albemarle Playhouse Dinner Theater, on 250 West, where there is now a Korean church. His first night of work couldn’t even scare him off: both cooks quit, the dishwasher called in sick, the rising stage got sideways spilling plates and dinner, and the sewer in the kitchen backed up ankle high. Undeterred, Jeff gathered experience at the Mousetrap, The Parlor, and The Sow’s Ear. After many failed attempts to lock down a restaurant location, he decided to use his English degree to tutor at PVCC. He later completed his Master’s degree and taught at PVCC for several years. Finally, in 1979, he and two partners opened Random Row Restaurant downtown. This was before there was a Downtown Mall, and despite warnings from realtors and bankers that a restaurant could not succeed in that location. It turned out to be the perfect location, and the business prospered for many years. In 1994, Jeff left the restaurant business to work for local charities in management and fundraising as a way of giving back to the community that supported his business for so many years. After a successful career, which included helping organizations like Ready Kids, The American Shakespeare Center and Region Ten to purchase, renovate or construct the buildings of their dreams, he returned to the restaurant business as a semi-retired manager with his old friend Tom Lippmann, and his wife Beth. When Tom and Beth fully retired, Jeff and Chef Landon were able to put together a deal to purchase Vivace, an often discussed move they hoped would present itself, and it did. Jeff is happy to be back at the front door greeting new patrons and old friends, and creating more good times and fond memories for his customers. 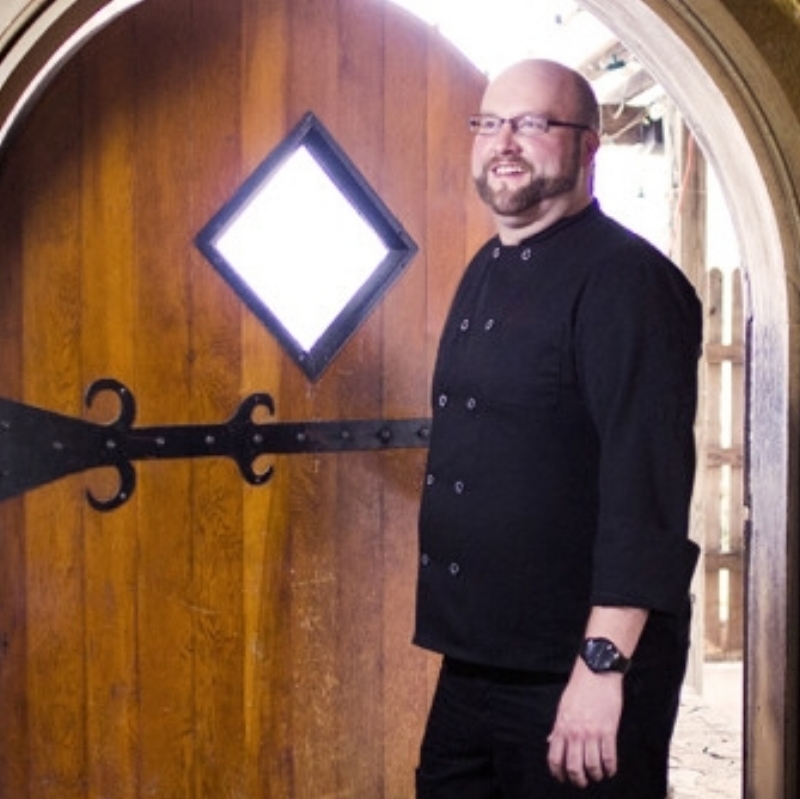 Chef Landon Saul, like many of the ingredients in his kitchen, is local. As a young boy raised in the foothills of the Blue Ridge Mountains, he took trips with his father to nearby orchards and farms to purchase fruits and vegetables for the family grocery store and helped his parents in the butcher shop. Family meals at the Saul household were often derived from vegetables picked fresh from the family garden and, today, Landon's cooking remains a reflection of this tradition. Landon's childhood love of food eventually blossomed into the pursuit of a career. He apprenticed at some of Central Virginia's best restaurants and his formal training, coupled with his commitment to Virginia's fresh and seasonal ingredients, put him at the forefront of the 'local food' movement. As his studies progressed, Landon developed a taste for the beauty and simplicity of Italian ingredients and culinary tradition. In 2013 Landon was given the rare opportunity to train with the Master Chefs of the Italian Culinary Institute in Calabria, Italy, which allowed him to hone his talent alongside some of the finest Chefs in the world. Having excelled in his studies, Landon returned to bring inspiration and innovation back to the Vivace kitchen. Now, combining true Italian tradition with creativity and local ingredients, Landon masterfully brings the best of both worlds to your table. Supplementing Virginia's finest bounty only with Italy's most superb ingredients, Landon ensures that every dish is fresh and delicious. Let the food bring life to your table at Vivace!